Founded in 1983, Pitti Laminations Limited is India's largest and most reputed manufacturer of Electrical Steel Laminations, Motor Cores, Sub-Assemblies, Die-Cast Rotors and Press Tools. It is the largest exporter of laminations from India. The company has already diversified into manufacturing of Castings, Steel Fabricated Parts and machined components stator and rotor assemblies with plans of diversifying into forgings. Growth is targeted through continuous forward and backward integration plus enhancement of capacities. Better Industrial output expected in near term on account of good monsoon, 7th pay commission and restocking of inventories post GST. Pitti Laminations registered an exceptional revenue growth of 58.7% YoY to INR 92.1 cr. in Q1, FY 2018 on account of growth in domestic volumes and better price realization. Domestic sales accounted for 70% of total sales while Exports accounted for 30% of total sales. Domestic sales grew by 68.7% YoY to INR 64.2 cr. and Export sales grew by 40.5% YoY to INR 27.2 cr. in Q1, FY 2018 as compared to Q1, FY 2017. Other operating income accounted for INR 0.7 cr. EBITDA for the quarter increased by 44.4% to INR 12.5 crores, compared to INR 8.6 crores in Q1 FY2017. EBITDA margin for the quarter was 13.5% and PAT for the quarter was INR 2.5 crores, an increase of 292% from Q1, FY 2017. PAT margin in the quarter was 2.7%. Net worth of the company stood at INR115.1 crores at the end of the quarter. 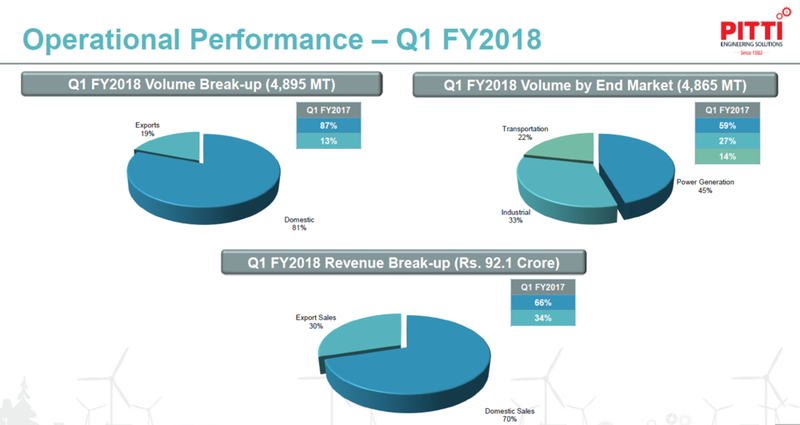 Overall volume registered a strong growth of 15.1% YoY to 4,895 MT, with domestic volume growing by 7.2% YoY to 3955 MT and export volume growing by phenomenal 66.4% YoY in Q1, FY 2018 as compared to Q1, FY 2017. Sales of stator frames witnessed huge growth of ~11 times, from 36 units in Q1, FY 2017 to 440 units in Q1, FY 2018. Volume expectation for the year FY 2018 is total 22000 MT of lamination. Breakup into domestic and export is 18,000 MT for domestic and 4,000 MT for exports in FY 2018 & ~6000 MT in FY 2019 as compared to 2600 MT in FY 2017. The company expects to produce ~26000 MT in FY 2019. Pune operation is expected to be shifted to Aurangabad and start operation there by Q3, FY 2018. The facility will have both laminations and machining capabilities. Debt has increased on account of CAPEX. The total expenditure has been INR 78 crores for setting up two plants, one in Hyderabad called Plant 4 and other in Aurangabad. Capital expenditure on modernizing certain machineries and equipment is ~ INR 30 crores. The Debt would have a payback cycle of 5-6 years with regular repayments. Apart from abovementioned CAPEX, no future CAPEX requirement is seen in near to medium term. Pittil Castings is a Promoter Group company. Its annual revenue is ~ INR 80 crores and EBITDA margin is 16%. Stator frames, among the value added products, offers a good margin and it is currently being supplied to GE against the 10 year contract. Its demand will remain the same as it would be supplied in equal quantity over the 10 year period. It along with other parts is expected to give revenues ~ INR 50 crores-55 crores per year. Sales of Wind turbine generators are expected to remain stable with present order book position. Company is seeing pick up in transformers business and it is getting good orders from transmission side, with companies such as Bharat Bijlee. In domestic market, Company is in discussion with Alstom for contract as Alstom has received orders from Indian railways and would come to buy into markets. The contract is roughly estimated to be worth INR 200 crores- 300 crores with 7-8 years of tenure. The company is going to produce small laminations for Crompton from their Aurangabad Plant. The annual quantity would be 1000 tons at price realization of INR 100 per kg. The quantity may grow up to 3000 tons per year in future.